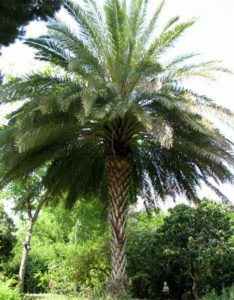 When I came to see our new house for the first time 3 years ago, the first thing I noticed about it was the huge palm tree in the front yard. After we moved in, I loved how our beautiful tree filled the bedroom window with green. On sunny days we enjoyed its shade. And on Succot, we didn’t need to buy schach to cover our Succah, my husband just sawed down a bunch of its green branches. Our palm tree even sprouted its own lulav every year. How cool was that! But this year, before Succot, my husband noticed something strange. There was no new lulav. 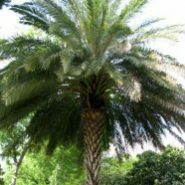 Our neighbor, a gardener, confirmed my husband’s fears–no lulav meant the tree was dying. 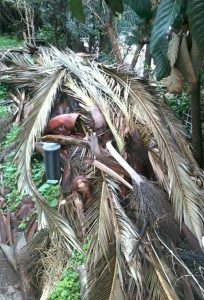 Our tree’s death, and specifically it’s missing lulav, reminded me of the spark of holiness, the connection with Hashem, in every Jew. In me and you. And how important it is to guard that spark. To keep that flame alive. So that we are truly alive. It happened to us as well. 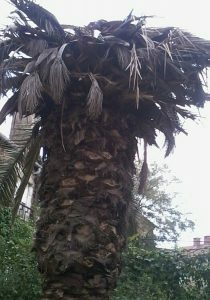 The gardener said that in the past few years a virus has been taking many palm trees all over Israel. Maybe you can plant a new tree on tu bshvat? !